This DVD from "Bill Traylor's Southern Gospel Hour" is a heart-warming collection of gospel music and reminiscences of past performances with Bill and his guests. This edition includes performances from Ivan Parker, Walt Mills, Anthony Burger, and others. 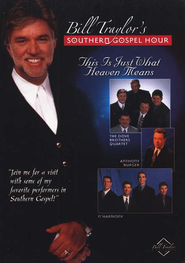 Tracks: "I Pledge Allegiance to The Lamb"- Dove Brothers Quartet; "When I Get Carried Away"- Ivan Parker; "This Is Just What Heaven Means"- Walt Mills; "I Shall Never Forget the Day"- The Speer Family; "Champion of Love"- Anthony Burger; "The Brush"- The Homeland Quartet; "Your First Day In Heaven"- N'Harmony; "He's In the Midst"- The Bishops; "The River Still Flows"- Dixie Melody Boys; and "A Little Faith"- Florida Boys.